Better Buy: CenturyLink, Inc. vs. T-Mobile US, Inc. There should probably be a mercy rule for these head-to-head comparisons. This telecom battle isn't even close. Though both companies work in the telecommunications sector, T-Mobile US (NASDAQ:TMUS) and CenturyLink (NYSE:CTL) could hardly be more different. It should be hard to find an investor that sees value in both of these stocks today. So which one should you own? "Go easy on 'em, Pete." Image source: Getty Images. Data taken from YCharts and FinViz. TTM = trailing 12 months. TMUS Revenue (TTM) data by YCharts. To be fair, this problem is not CenturyLink's alone -- the company is simply stuck in an aging sector. Cable companies, in general, aren't doing great these days, as their landline cable TV and voice services are losing their appeal. 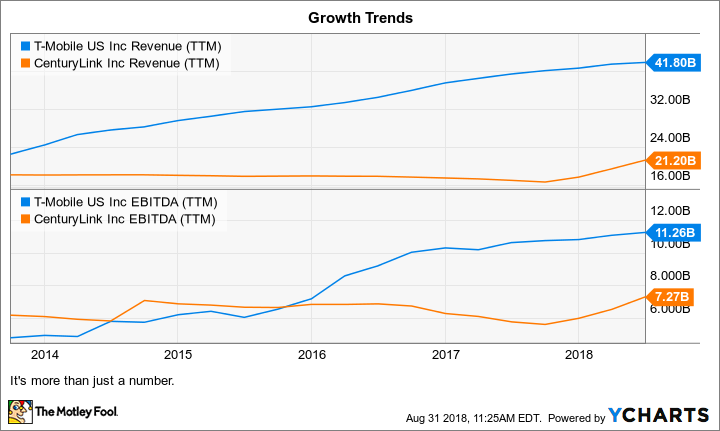 Management is obviously aware of this unstoppable trend, which is why CenturyLink merged with data services specialist Level 3 Communications last year in a $24 billion blockbuster deal. The way forward is more about providing broadband networking services to business customers, but that's also a brutally competitive sector with several large and well-heeled rivals. And the Level 3 deal is no silver bullet. Among the best reasons for CenturyLink to pull the trigger on that deal was Level 3's $10 billion reserves of aggregated operating losses, which will be used for tax credits that should boost cash flows and earnings over the next few years. In other words, some of the bottom-line muscle you see in the table above is built on Level 3's tax credits and won't stick around for the long haul. For now, CenturyLink is pouring 87% of those artificially inflated cash flows into a generous dividend policy. The company is not in the habit of boosting its quarterly payouts, but it's hard to complain about a 10% dividend yield -- that is, until the tax credits run out and CenturyLink is forced to lower those juicy payouts. This is not a Dividend Aristocrat in the making, folks. In the opposite corner, T-Mobile is growing its wireless business faster than any of its major rivals in North America. Adding more fuel to that fire, T-Mobile is knee-deep in a proposed merger with fellow mini-major telecom Sprint (NYSE:S), jockeying for regulatory approvals. Sprint and T-Mobile argue that they can't compete on a level playing field unless they're allowed to join forces. I think that's true for Sprint, but it sounds like hot air coming from T-Mobile. That company has a proven ability to deliver subscriber and revenue growth in a variety of economic operating environments. If the deal never comes to pass, I think we'll see Sprint spiraling down into an inevitable bankruptcy while T-Mobile makes do with its own radio-spectrum licenses and subscriber lists. That being said, a successful merger would give T-Mobile a huge adrenaline shot -- and I'm not convinced that this potential growth catalyst is properly priced into T-Mobile's shares yet. Long story short, we're pitting a near-obsolete business against a healthy growth stock here. CenturyLink is desperately trying to find a viable long-term business model in the Level 3 buyout, while T-Mobile just wants to boost its existing growth trajectory into a higher orbit. In case I didn't make this crystal clear yet, let me just say that T-Mobile looks like a great buy today, but you won't find me poking CenturyLink's stock with a 10-foot selfie stick. I don't even trust that huge dividend in the long run.